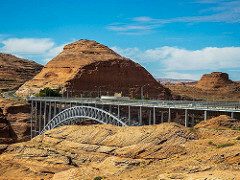 glen canyon dam by Glenn Scofield Williams ConstantinAB is licensed under a Creative Commons Attribution 4.0 International License. When I was a girl I spent some summer vacations with my grandparents in Northern Arizona on the edge of the Navajo reservation. My grandfather owned two service stations in the small town of Page, Arizona, just up the road from the Glen Canyon Dam and Lake Powell. We all spent summers with Grandma and Grandpa in Page, me and my sister, my cousins (four boys around the same ages as my sister and me), and other cousins, although not at the same time, but many times over the years as we were growing up. As a teenager, I somehow learned that my grandfather knew some of the Navajo language. I had come for the summer to stay with my grandparents, who had arranged a summer job working in the local coffee shop, and every day I went to work on the early shift (6 am to 2 pm), came home and did some reading or sometimes worked on sewing projects – my grandparents didn’t believe in kids watching TV for entertainment – had dinner with Grandma and Grandpa, and started all over again the next day. I remember that I longed to learn some Navajo. I was intensely curious about the words and about the language. It seemed very mysterious and exotic. When my grandfather would come home from the service station in his dark blue work pants and sturdy-toed boots, wearing his blue-striped shirt with the embroidered patch with his name, “Larry,” stitched on the front, I really wanted to ask him if he could show me how to say some words. I knew he was friends with some of the Navajo families on the reservation, and that they were his customers like anyone else, which did not always happen in his small town. Somehow I had heard he was even given a name by the families he knew, a word meaning “Red Shirt,” apparently referring to a red-plaid shirt he had often worn. I had heard he was invited to funerals among these families, that they trusted him and that he was part of their community. I had been told he knew some Navajo through his connections with the community. 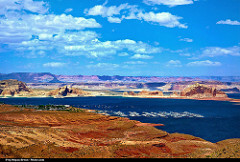 Lake Powell by Moyan Brenn is licensed under a Creative Commons Attribution 4.0 International License. How did I hear these stories? I’m not sure even now. I think my grandmother might have told me, though she was not particularly keen on Navajos. She didn’t denigrate them, she just had no passion for learning about a different culture. My grandfather was an amazing storyteller, and perhaps he told some of these stories to me and my sister when we were little. I’m not sure why I don’t remember exactly how I learned about his familiarity with the Navajo families he knew. As much as I longed to learn Navajo, as much as I wished I could ask my grandfather, somehow I could never bring myself to ask. Almost every evening I would will myself to ask as he put his jacket in the hall closet by the front door. But I just couldn’t bring myself to do it. Why not? I’m not sure. Partly, this was a generation of grandfathers who were not particularly interactive with their grandchildren. My grandfather worked hard supporting the family – and sometimes extended family, when needed – but when he came home to the small one-story desert cinder-block house on the edge of the Page mesa every evening he didn’t seem to want to talk. He was in a service business, he probably wanted to rest, to read the paper perhaps; I remember him sometimes playing the organ that sat in the corner of the living room, probably to relax. He would play “You Are My Sunshine” or “My Wild Irish Rose,” his fingers gently flying over the dual keyboards, his feet rotating among the floor pedals for the bass notes. Now when I think about this memory, I wish I could go back to that teenage girl and say, Go ahead and ask him. Just say: Grandpa, I’m really interested in Navajo, could you teach me a couple words? I’d say it at the end of the day, maybe; just after he finished playing music might be a good time. In the morning at breakfast he could be remote, intent on the day’s business, and on the weekends he often had a catch-up repair job at the service station or several boat rentals to take care of as part of his service station business. It’s funny how, when we are children, we can feel reluctant to ask a grandparent about their lives, held back by some imagined restriction that they might be upset or annoyed by our questions. When you are young, your grandparents can seem almost god-like, as though they have a routine that should not be disturbed, and that the questions of their grandchildren would seem to be extraneous or unimportant. So we don’t ask. Now that I have been a parent and a grandparent, I find myself hoping for those questions. Grandma, what was it like when you were young? What TV programs did you watch? – (at home, not at my grandparents’ house . . .) Who was your favorite teacher? What did you like to do after school? I think, perhaps, if I had asked, I might have found my grandfather was not as reluctant to talk as I thought at the time. And perhaps he might have been thrilled to teach me a few words of the Navajo language. Oh Theresa, this is such a wonderful memory and you have narrated superbly that I can almost picture the scenes and hear the words, your thoughts. This is awesome. I think great stories come from vivid memories although with some mysteries and questions that seem to have no answers… and that’s okay because that’s what makes life interesting and stimulating. And I love the throwback theme! 🙂 I think it’s awesome to reminisce and share memories; it makes them almost eternal. I have always wanted to go to Arizona and also been fascinated by the Navajo. Great story. There are some sites (not sure about Navajo but I l know for Sioux) for learning the language. The one I found did have audio. Oh, that is a great idea. Maybe I’ll look for that. I know it’s a super-hard language, at least I’m guessing so b c of the use of the language as a code during WW II. Thanks, athling2001!